A bright, well balanced Pinot Noir showcasing excellent Sta. Rita Hills vineyards. Enjoyable now, will gain more complexity with age. This wine is charming and bright with aromas of black cherry, Santa Rosa plum and pomegranate accented by a subtle earth tones and native flora, such as lavender and sage. On the palate, a solid core of rich Pinot Noir expression is surrounded by hints of dark cherry and black tea. Well-balanced, velvety tannins give way to a bright, appealing finish. While the drinkable style of this wine makes it enjoyable upon release, additional bottle age will promote even more depth and complexity. 44% Rancho La Viña, 30% Rio Vista, 13% Zotovich, 7% Radian and 6% Buona Terra. This wine showcases some of the finest Pinot Noir vineyards in the Sta. Rita Hills appellation of Santa Barbara County. The backbone of the wine is Pinot Noir from Rancho la Viña Vineyard, situated in the cool and breezy southwest part of the appellation, and Rio Vista Vineyard, located at the eastern, slightly warmer end of Sta. Rita Hills. The balance of the blend combines cool climate Pinot Noir from the western reaches of Sta. Rita Hills for an exceptional, beautifully integrated wine. The 2015 vintage is a record vintage in many ways. It was the earliest harvest on record, eclipsing the previous 2014 record by up to two weeks for most varietals. A relatively mild winter led to an early start to the ripening cycle. Once buds began to push, mild spring weather allowed them to develop at an accelerated pace uninterrupted by spring frosts. Yields were also record low, especially in Pinot Noir, averaging 30-50% below historical averages. Near perfect ripening conditions coupled with small berry size resulted in superb quality fruit. Harvest dates ranged from August 18 to September 5. Pinot Noir clusters for this wine were hand sorted before being de-stemmed and gravity fed to fermenters. The must was immediately chilled for a pre-fermentation cold soak where the most beneficial extraction of color, aroma and flavor occurs. During fermentation, concentration was enhanced by gently punching down the cap several times per day. The wine aged 10 months in French oak barrels with 30% new French oak and was bottled on August 4, 2016. 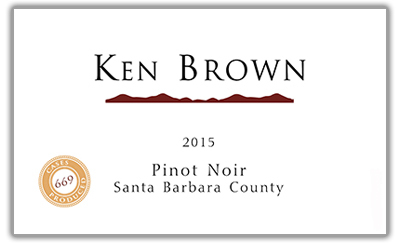 By entering Ken Brown's Wine Store, you affirm that you are of legal drinking age in the country where the site is accessed.